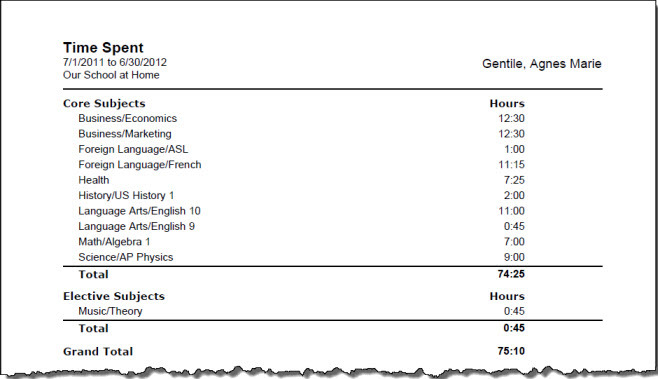 Use this report to show the amount of Time Spent or Sessions for each Subject/Course over a selected date range. Subjects are listed alphabetically, with their Courses, and grouped by Core and Elective according to your Subject designations. You must have either Time Spent or Sessions enabled in order to utilize this report. The default name for this report is: Time Spent/Sessions. You can change the Report Title to anything you like, up to 150 characters. 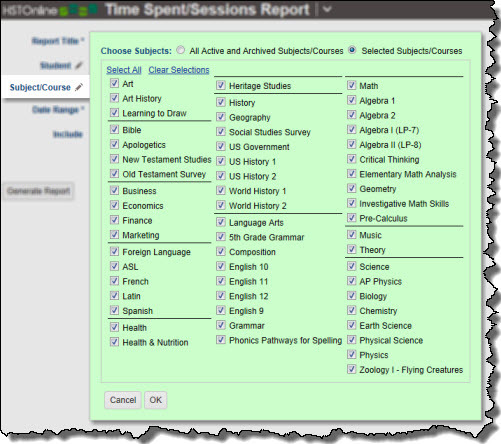 Incomplete Assignments: Time Spent or Sessions for any Assignment which has no checkmark in the Complete: Teacher box and falls within the selected date range will be included in the report. 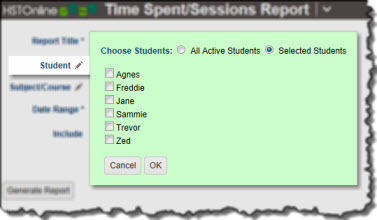 Complete Assignments: Time Spent or Sessions for any Assignment which has a checkmark in the Complete: Teacher box and falls within the selected date range will be included in the report. 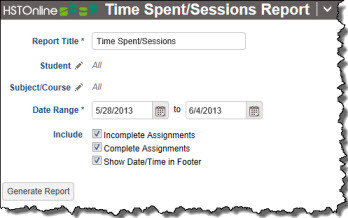 On the HSTOnline menu, click or touch 'Time Spent/Sessions' under the 'Reports' section.